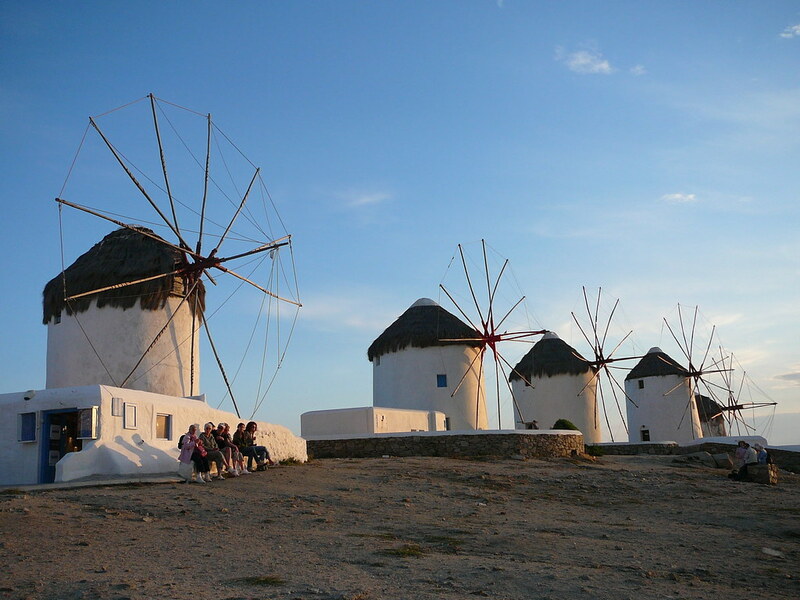 Mykonos is a Greek island, part of the Cyclades, lying between Tinos, Syros, Paros and Naxos. The island spans an area of 85.5 square kilometres and rises to an elevation of 341 metres at its highest point. There are 10,134 inhabitants, most of whom live in the largest town, Mykonos, which lies on the west coast. The town is also known as Chora. The island spans an area of 85.5 square kilometres and rises to an elevation of 341 metres at its highest point. It is situated 150 kilometres east of Athens in the Aegean Sea. The island features no rivers, but numerous seasonal streams two of which have been converted into reservoirs. It produces 4,500 cubic metres of water daily, by reverse osmosis of sea water in order to help meet the needs of its population and visitors. Although temperatures can rise as high as 40 °C in the summer months, average high temperature is around 28 °C and because of the seasonal cool "meltemi" wind, summer days are dry, sunny and pleasant. In the winter, average high temperature is around 15 °C. The winters in general are mild and wet, with many sunny days still even in mid-winter. Snow is infrequent and doesn't stay long on the ground when it falls. The blue markers shows the location of various accommodations in Mykonos. The letter in the marker describes the accommodation types: H for Hotel, A for Apartment, R for Resort, B for Bed & Breakfast and O for Other (e.g. pension, villa). Click on the blue marker for more information on the accommodation.